The suggestion is start a baseball game with “the Opener”, kind of like a closer, someone to pitch lights-out for the first two innings and then hand over the next six or seven innings to, well, the starting pitcher. So, why ask starters to pitch until they fail? Why not ask them to pitch for just six innings, the third through the eighth? 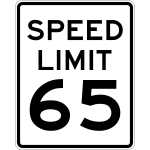 Most starters would be delighted by this “light” load and pace themselves accordingly. I’m not a pitcher or even a baseball player, but I just think there’s a lot of weakness in not knowing how long you’re going to be out there. 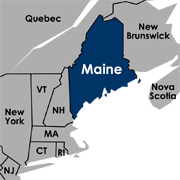 Subsidized vacations for citizens over 65, kids between the ages of 18 and 25, and families facing “difficult social, financial or personal” circumstances. Sleet and snow and frost and rime. Eighteen hundred and froze to death. Oddly they see it in a positive light, which I equate with making lemonade out of lemons. Personally I don’t care much for frozen lemonade, though. The extraordinary cold state of the atmosphere during the week past, surpasses the recollection of the oldest person among us. The wind from N. to N.W. continued extremely high till yesterday [June 11] accompanied with a winter chill that rendered a fireside very comfortable – but a check is given to all vegetation, and we fear the frost has been so powerful as to destroy a great portion of the young fruit that is put forth. – On Saturday last [June 8] a gloom was cast over the face of nature by the appearance of snow which fell plentifully about 7 o’clock in the morning. On Monday [June 10] the coldest since 25th of May, thermometer stood in the morning 34 above 0 – much ice made in various parts of town the preceding night; and in the country we are told it was more severe. Yes, snow on June 8th, ice on June 10th. That’s not what I’m looking for in my summer vacation. Just to prove how weird this all is, I’m going to quote another poem; Darkness was written by Lord Byron in July 1816 … during that summer. The Freakonomics blog over at the New York Times is always an interesting read. I love the decennial census, but you know this (see Census Fun). We got our form in the mail the other day and I was confused to see you couldn’t fill the form out online. Doesn’t that seem like a logical option? I love-love-love things like this. 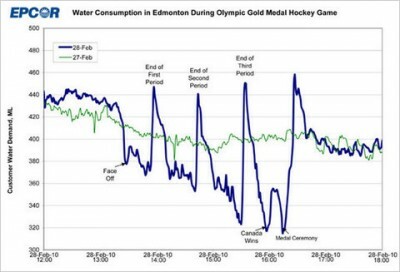 From the Freakonomics blog at the New York Times we get a graph showing water consumption in Edmonton from February 28 – during the men’s Olympic hockey gold medal game. Green line is the consumption from February 27.